EASY GAUGE is a compact tool that accurately determines the diameter of a drill bit prior to its use. 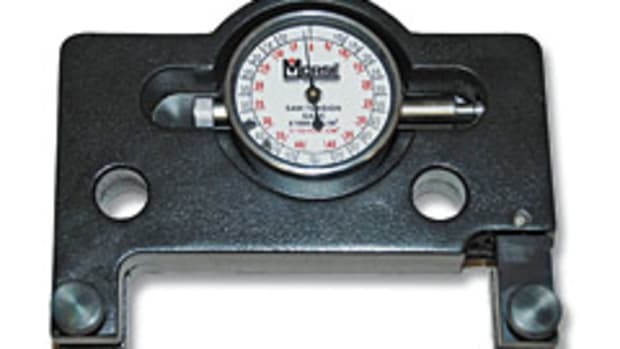 Designed and manufactured by Intromark Inc., the gauge is semi-circular and has a cut- out arch, which sizes drill bits in millimeters or inches. The user only needs to insert the end of the drill bit until both sides of the gauge meet with the bit. At the meeting point, the scale can be read. The Easy Gauge can also measure a fastener to determine the size of a drill bit required for a job by inserting the screw through the tool. The gauge is priced at 99 cents. Contact: Intromark Inc., 217 Ninth St., Pittsburgh, PA 15222. Tel: 800-851-6030.